Moving from on-prem to public cloud brings tremendous benefits to organizations in terms of being able to scale quickly, carry on development in an agile fashion, and have access to some of the most powerful datacenters and application platforms in the world. All of this simply would be out of reach of most organizations trying to build their own infrastructure from scratch. Organizations who are hesitant to move data or business-critical services to the public cloud often cite fears over data protection as well as security. 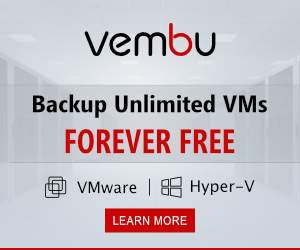 On-prem, organizations have backup solutions they have often used for years and have control over a firewall on-prem they feel comfortable managing. All of these familiarities can be lost moving to public cloud environments. 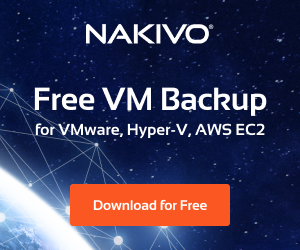 The truth of the matter is, public cloud environments are lacking when it comes to native backup solutions for your data. A solution that I have found extremely powerful in the Google G Suite environment is Spinbackup. 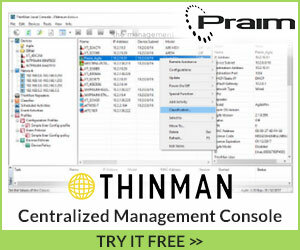 I have written several posts covering the product from installation to configuration. Spinbackup provides an extremely robust machine learning powered, API driven CASB that provides a comprehensive data backup and security solution for G Suite environments. Exciting news as of recently – Spinbackup announced their beta for Office 365. The road map includes bringing all the same functionality that exists in the G Suite service to Office 365. 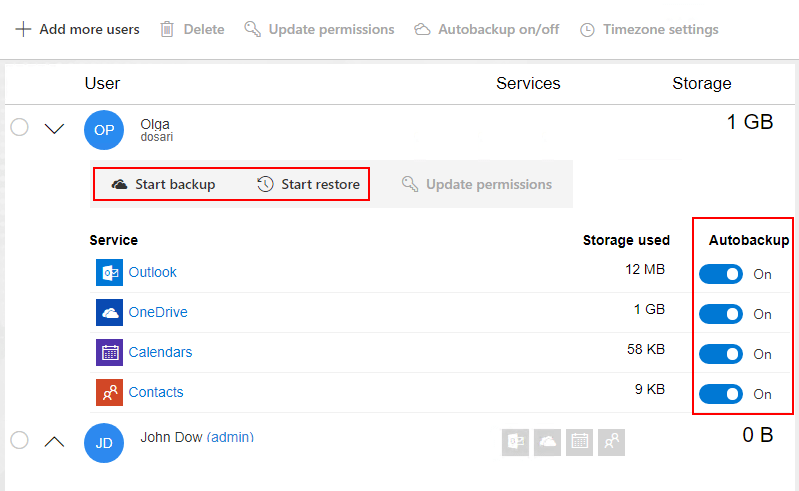 Let’s take a look at Spinbackup for Office 365 Beta released backup and disaster recovery features to look at this new solution protecting Office 365 environments. If you have not heard about Spinbackup before, they are certainly a company that is worth taking a closer look at. When it comes to cloud backup and security, all in one solution, there simply isn’t a better vendor out there doing the comprehensive things that Spinbackup is doing for Google’s G Suite environment and now Microsoft’s Office 365 public cloud. 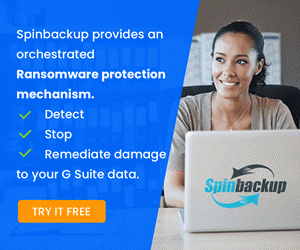 Let’s take a moment to look at Spinbackup’s fully featured solution for Google’s G Suite environment, including data loss and data leak protection as well as their cyber security features. Automated Cloud-to-Cloud Daily backups – Spinbackup provides automated daily backups of your G Suite data to either the AWS public cloud or Google’s Cloud Storage, allowing the storage of G Suite data to be housed out of the scope of Google G Suite. Backups can be configured 1 to 3 times daily. Ransomware Protection – Powerful Ransomware protection for cloud environments that is proactive. Many have the misconception that public cloud environments are immune to the effects of Ransomware, however, this is not the case. 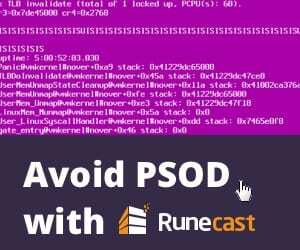 With file synchronization apps that are provided by most public cloud vendors, infected files can be inadvertently synchronized to public cloud storage, resulting in data loss in the public cloud due to Ransomware encryption. Third-party apps control – While legitimate third-party apps can provide very beneficial extensibility to public cloud environments just as G Suite, they can also be a source of tremendous risk to organization data. Most end users grant permissions on connected mobile devices without thinking about the implications to organization data. With Third-Party Apps Control, Spinbackups is able to constantly watch the G Suite environment and automatically revoke access to risky applications based on machine learned behavior gathered by Spinbackup. Sensitive Data Control – Sensitive Data Control allows organizations to protect their sensitive data such as credit card numbers and prevent this data from leaving the G Suite organization. This is definable and can help organizations get a handle on GDPR initiatives among other security concerns in the G Suite environement. Insider Threats Audit – Risky users do not always originate from the outside with outright attackers. Threats to data security can certainly come from the inside as well. Users who are on the inside of the organization may accidentally or intentionally put data at risk. User credentials can become compromised. Again, with powerful machine learning, Spinbackup is able to quickly identify risky user behavior or anomalies in user behavior so as to pinpoint possible security breaches. All of the above functionality comes in a single solution and management “pane of glass” that allow G Suite administrators to have full visibility over both data protection and cyber security concerns in their G Suite environment. Microsoft’s Office 365 has certainly gained tremendous popularity among businesses today and seems to have a great deal of momentum behind it. 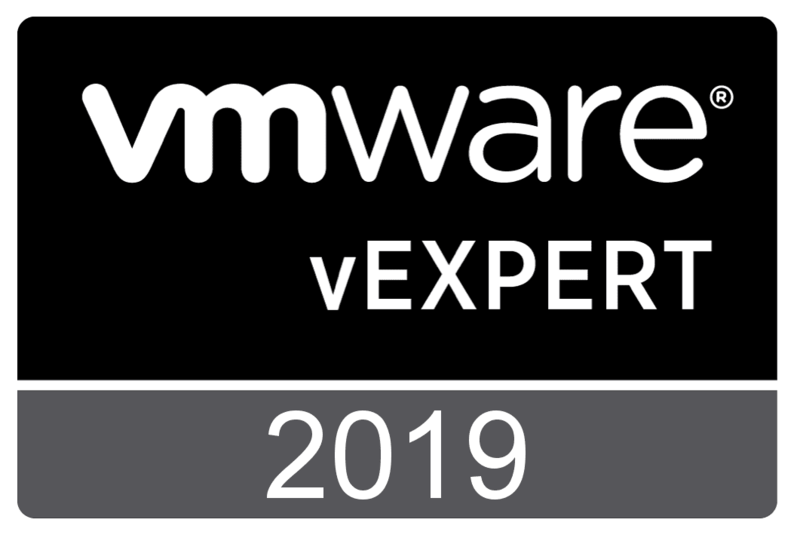 Much of this momentum comes from the familiarity with Microsoft applications and the historic stronghold that Microsoft’s Office products and operating systems have had in the enterprise for years now. The common familiarity with Microsoft applications and the ability from a license standpoint for organizations to install the full copy of Office 365 applications locally certainly lends itself to organizations choosing Office 365 for delving into public cloud. Ability to store copies of Office 365 data in Google’s Google Cloud Platform or Amazon’s AWS environment. Single pane of glass management plane that allows Office 365 administrators to have a common dashboard for managing their Spinbackup protected Office 365 environment. Once logged in, you can browse the Spinbackup navigation menu by choosing the tiled icon int eh upper left hand corner. Spinbackup contains highly customizable backup and disaster recovery features including services backed up, frequency, permissions to perform restores, and retention policy. Under the Users configuration area, you see the current users, which services are flagged on for Autobackup, the Storage used, etc. 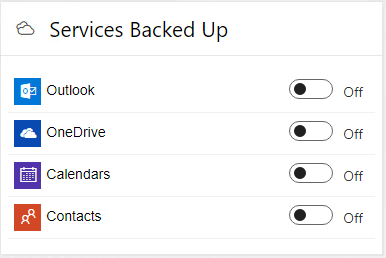 Under the Settings menu, you can globally set the Services Backed Up. The Automated Backup Frequency configuration allows setting the backup frequency to 1x/day or to 3x/day. 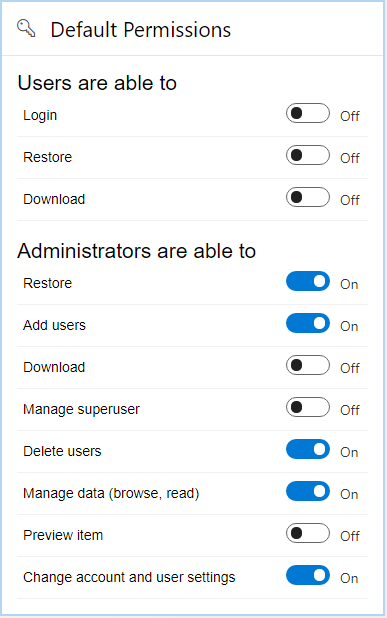 Under the Default Permissions, the Spinbackup/Office 365 administrator has the ability to define what users can do – Login, Restore, or Download. Administrator permissions can also be defined under the Default Permissions configuration. The default settings are shown below for both users and administrators. 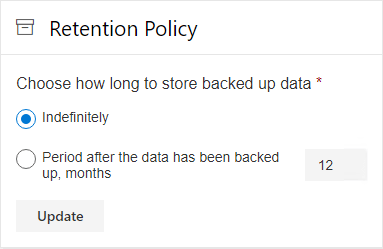 Another extremely important configuration when thinking about backups and disaster recovery is the Retention Policy. Here, you can choose how long to store backed up data. The options are Indefinitely or Period after the data has been backed up, months which is configurable with a number of months to retain. With Spinbackup, the Office 365 applications have a Backup, Restore, and Download option at the top of the application. This allows easily queuing a backup or restoring items granularly if need be to the same account or to a different target account. Performing an ad hoc backup of Office 365 service(s) with Spinbackup is extremely easy. You can click the Backup button at the top of the application and the backup will be queued for running. Restoring data is just as easy. You can click individual items to restore or simply restore en mass. An extremely powerful feature of Spinbackup for Office 365 is the ability to migrate data with one click between user accounts. 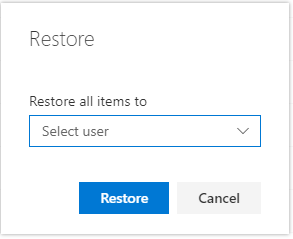 When you click the Restore option, click the change user button. It will then display the below dialog box that allows you to Select user, choosing the account you wish to be the target of the restore. This is extremely powerful if you have an Office 365 user account that is no longer part of the organization but contains extremely important data that you need to have copied elsewhere. The data can first be migrated to a different account and then the source user account can be removed. 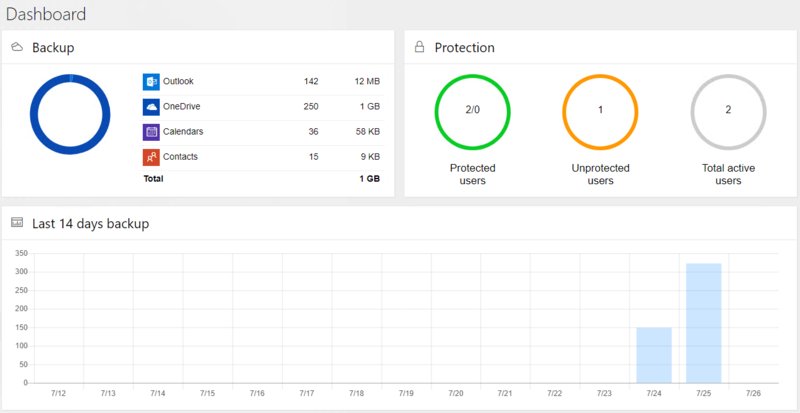 News of Spinbackup for Office 365 Beta Released backup and disaster recovery features contained currently, show an already impressive display of powerful protection for Office 365 environments. 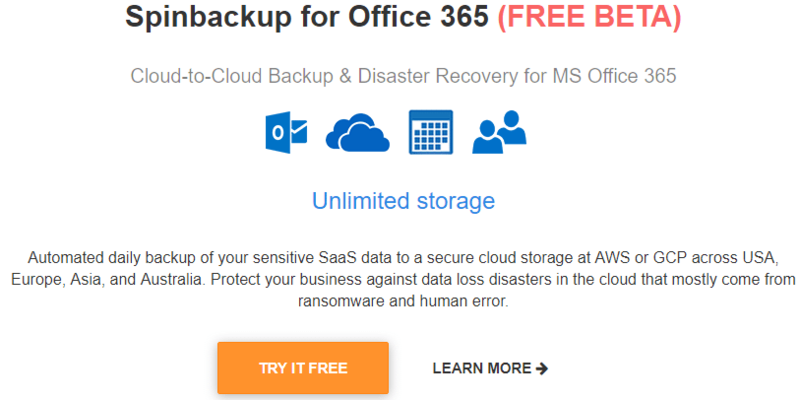 Having this type of highly integrated functionality right within the Office 365 environment allows organizations to have a robust and fully featured backup and disaster recovery solution to protect their Office 365 data. Additionally, as shown, this can be used to easily migrate user data between Office 365 users. Keep in mind, Spinbackup for Office 365 is in the beta stages currently and no doubt will be even more polished as development continues. Also, the solution will include the cyber security modules for Office 365 very soon. 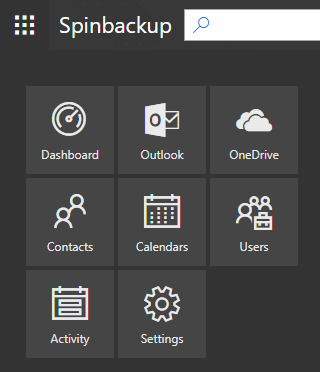 Be sure to try out Spinbackup for Office 365 Beta for free here.